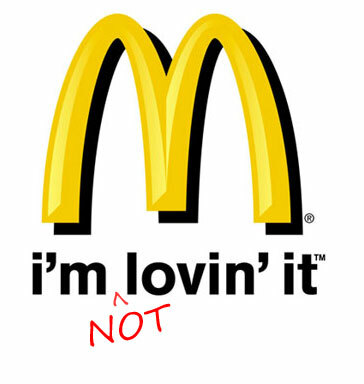 I have to accept that McDonalds have improved their game over the past few years, the serving of organic milk and the use of only British and Irish beef being prime examaples, but I still have a huge problem with a third McDonalds opening in Maidstone. Not only will we have three of them, the third is a drive through sited on part of the main gyratory system - a place of significant congestion all day long. Congestion will get worse in Maidstone. Given that such as scheme would naturally need a good level of consideration, you would think that there was signficant debate at the planning committee? No. The ward councillors failed to ask the plan to be debated and the officers agreed without further scrutiny. A huge failure of democracy. Seems you are missing the point. If they drive OFF the gyratory into McD then surely that is reducing the traffic rather than increasing it? Few will use this branch as a destination for, by definition, a drive-thru is an impulse destination, a service to motorists already en-route and crucially, providing employment, taxes and business rates income locally. By the way, I do NOT drive, am NOT fat and yes, do enjoy an occasional Mcd burger. Sorry Sir, your arguments are invalid just like those of your local green councillor here in Thanet although, by the time you read this Mr Clown-Ian Driver may have switched parties yet again. There are far better opportunities for the site than yet another McDonalds in Maidstone, opportunities that would provide jobs. We actually will have four McDonald's restaurants in Maidstone when this is built. Week Street, The Mall, M20 services and here. Way too many for a town of Maidstone's size, and even if they are going to build one, surely the Lockmeadow area would be a better choice? Not impressed by these plans at all. Oh wait, there's a Burger King at Lockmeadow, isn't there? On top of the one in Week Street... plus the Wimpey in Gabriel's Hill... as well as three Subways and two KFCs... oh yes, and two Pizza Hufs. Maidstone really could do without the excessive amount of junk food outlets it has. Just one of each chain restaurant would be enough.